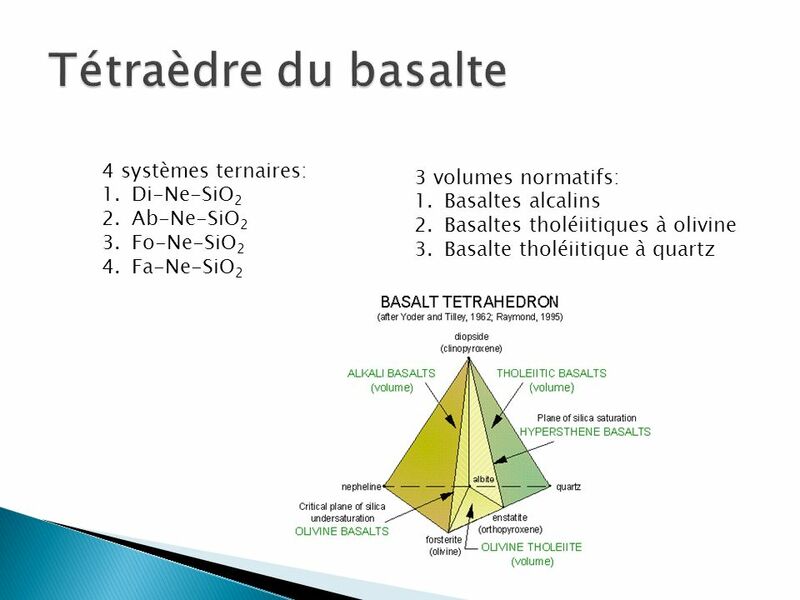 8 Diagrammes ternaires Figure 2-1a. 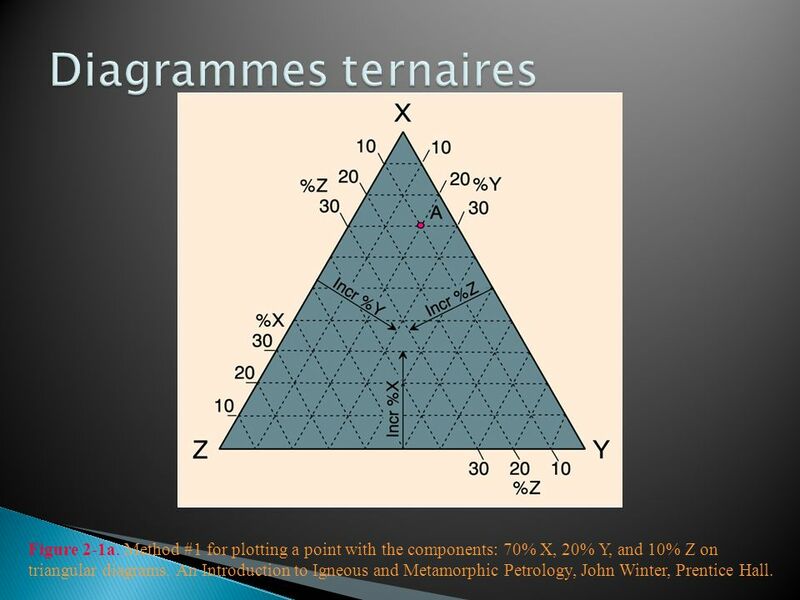 Method #1 for plotting a point with the components: 70% X, 20% Y, and 10% Z on triangular diagrams. 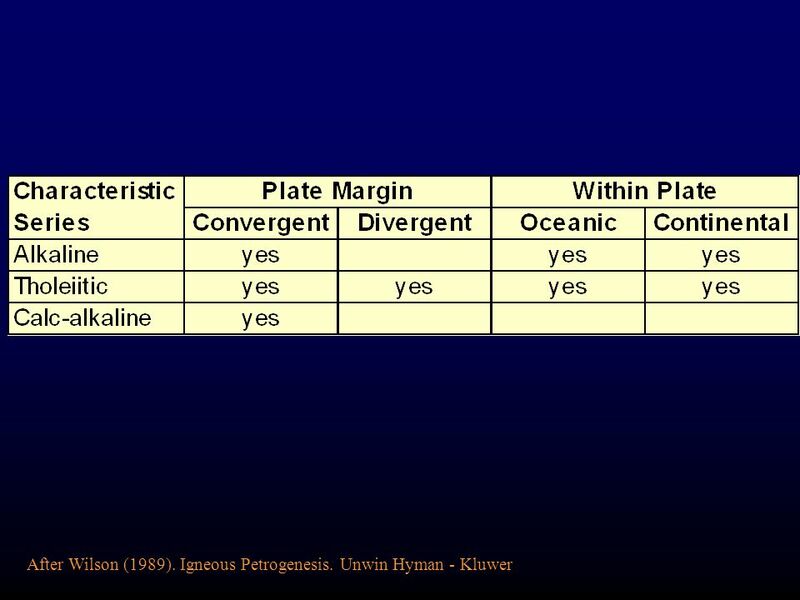 An Introduction to Igneous and Metamorphic Petrology, John Winter, Prentice Hall. 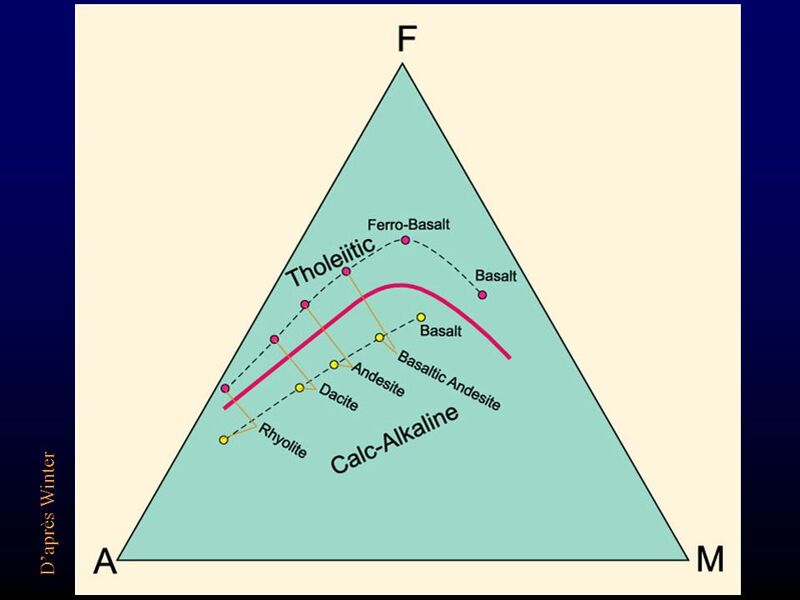 Figure 2-1b. 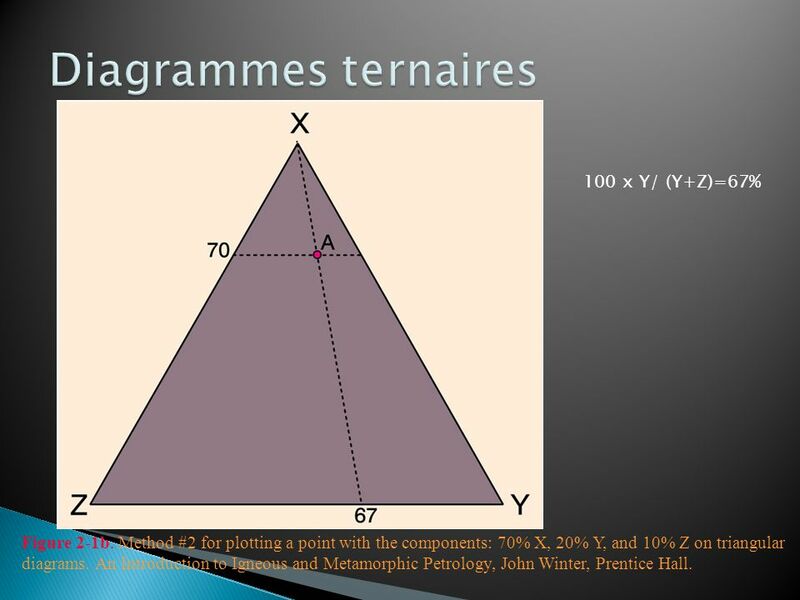 Method #2 for plotting a point with the components: 70% X, 20% Y, and 10% Z on triangular diagrams. 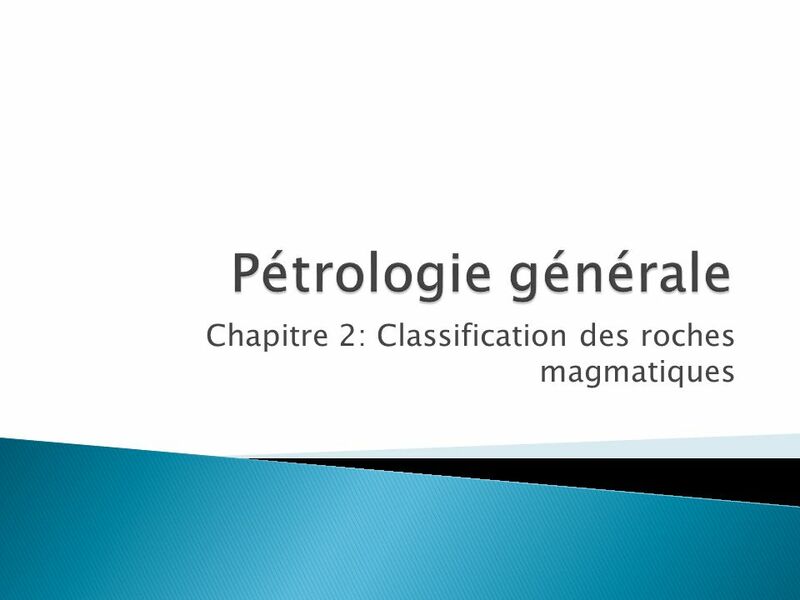 An Introduction to Igneous and Metamorphic Petrology, John Winter, Prentice Hall. 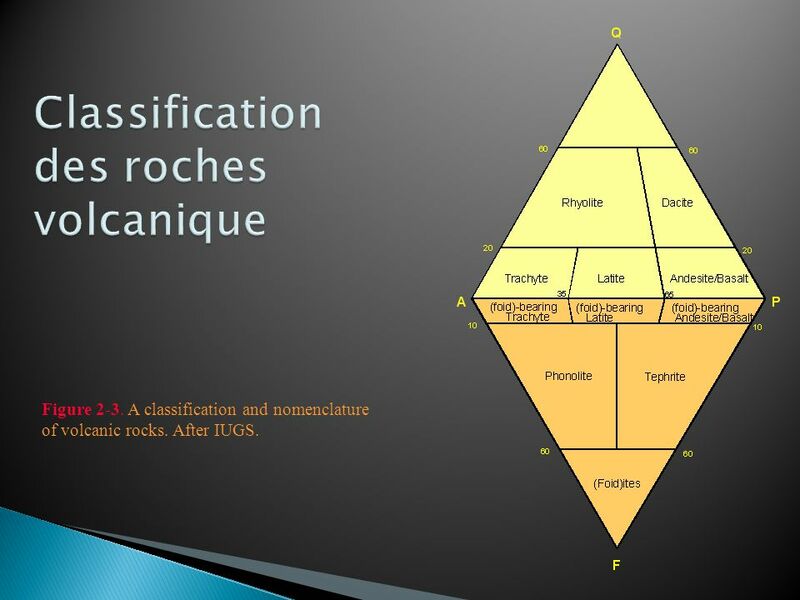 The rock must contain a total of at least 10% of the minerals below. 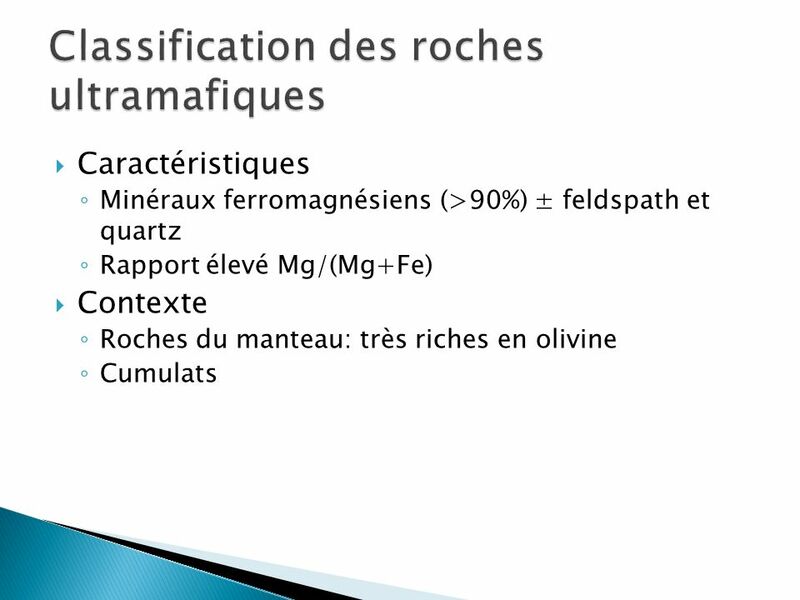 Renormalize to 100% Quartz-rich Granitoid 90 60 20 Alkali Fs. 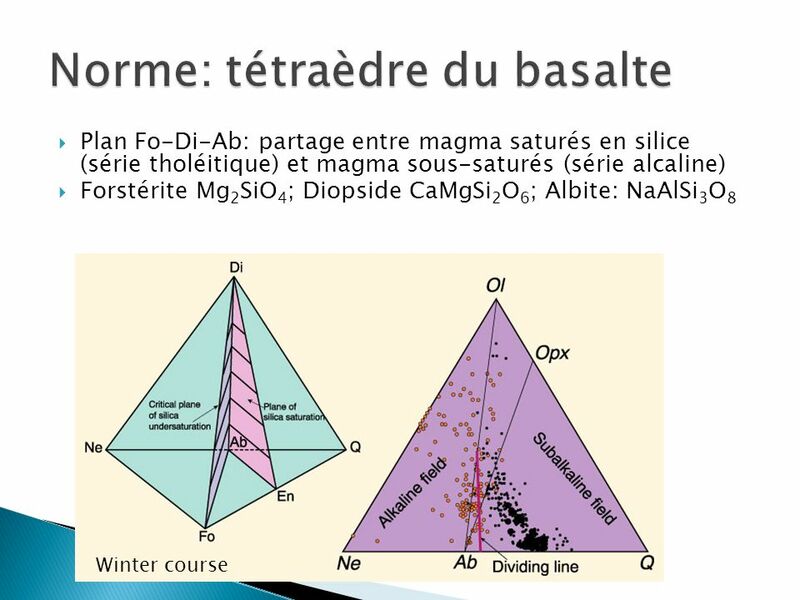 Quartz Syenite Quartz Syenite Monzonite Monzodiorite (Foid)-bearing 5 10 35 65 (Foid) Monzosyenite (Foid) Syenite (Foid) Gabbro Qtz. 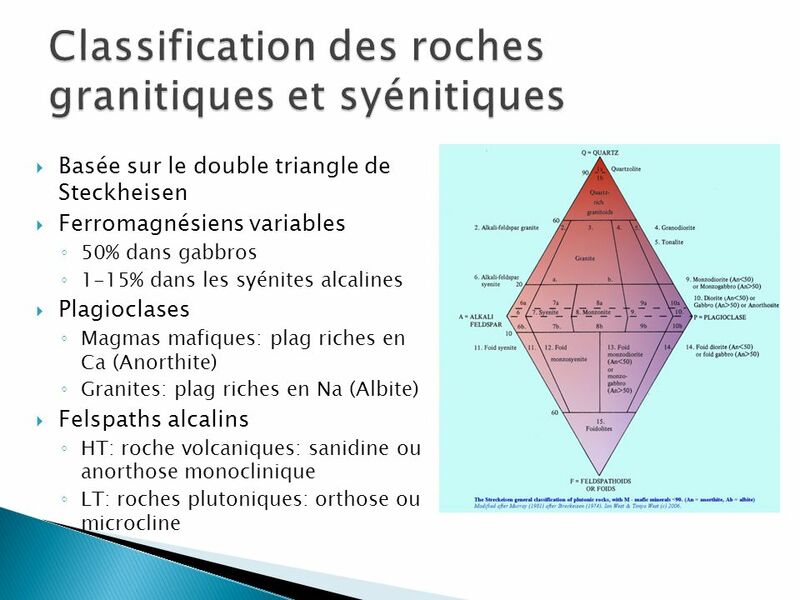 Diorite/ Qtz. 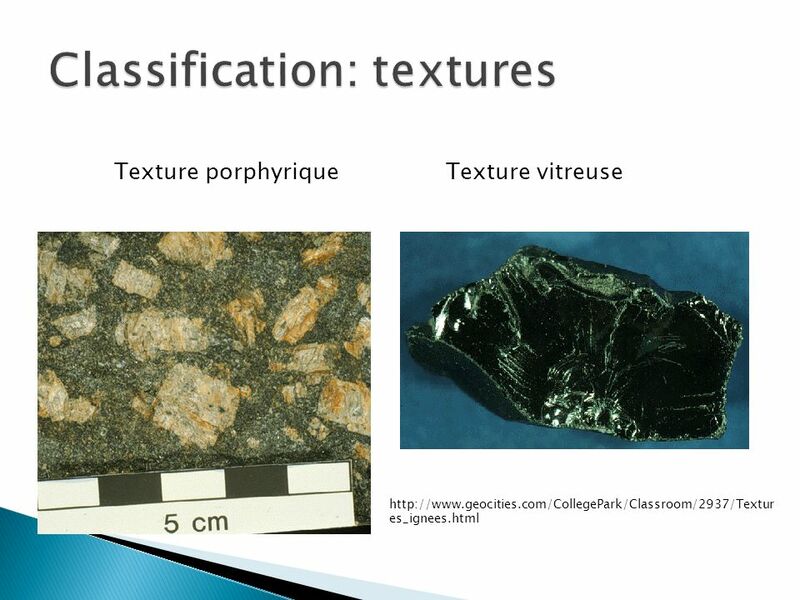 Gabbro Diorite/Gabbro/ Anorthosite Diorite/Gabbro (Foid)olites Quartzolite Granite Grano- diorite Tonalite Alkali Feldspar Granite Q A P F Plagioclases: anorthite-albite Feldspaths alcalins: Albite-Orthose Feldspathoides: leucite (V), néphéline, sodalite (P), noseane, hauyne (V) Figure 2-2. 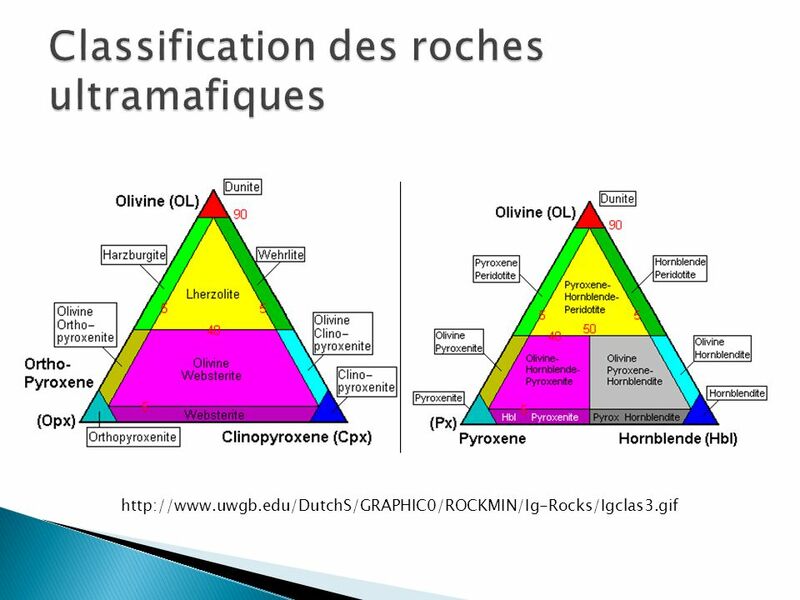 A classification of the phaneritic igneous rocks. 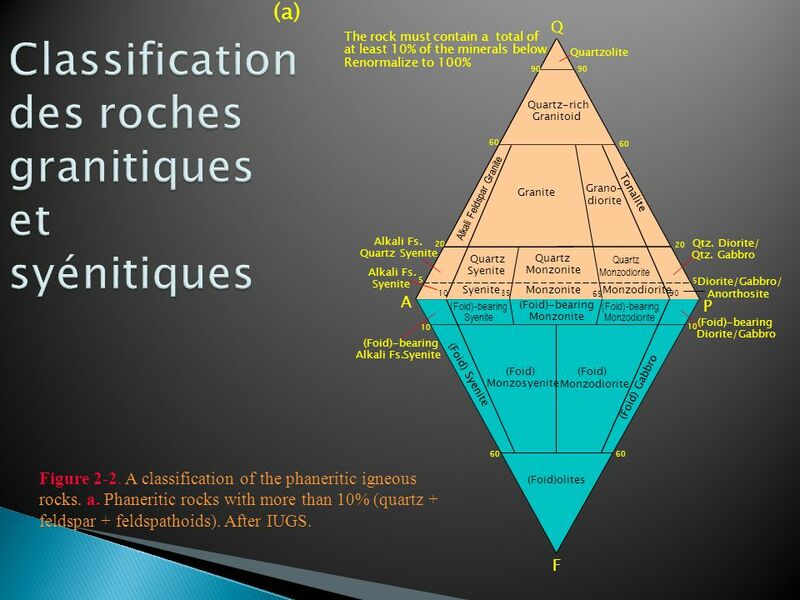 a. Phaneritic rocks with more than 10% (quartz + feldspar + feldspathoids). 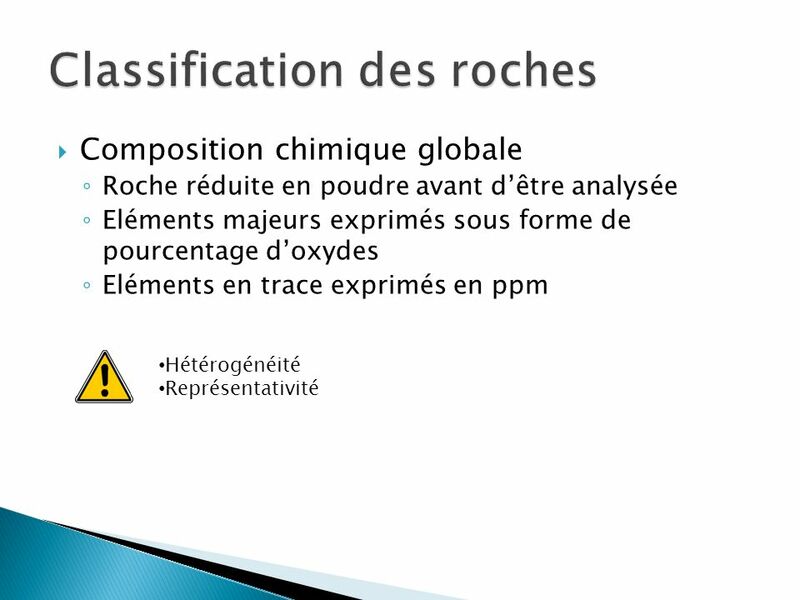 After IUGS. 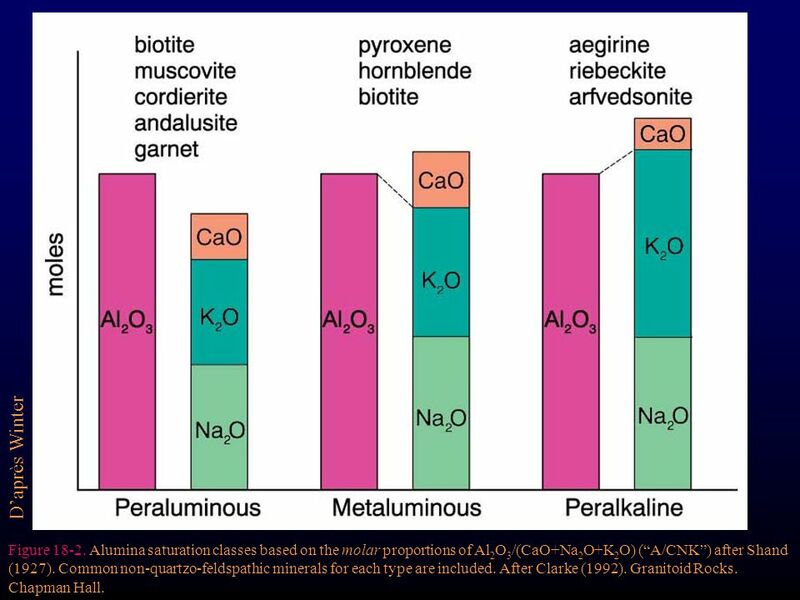 Figure 2-3. 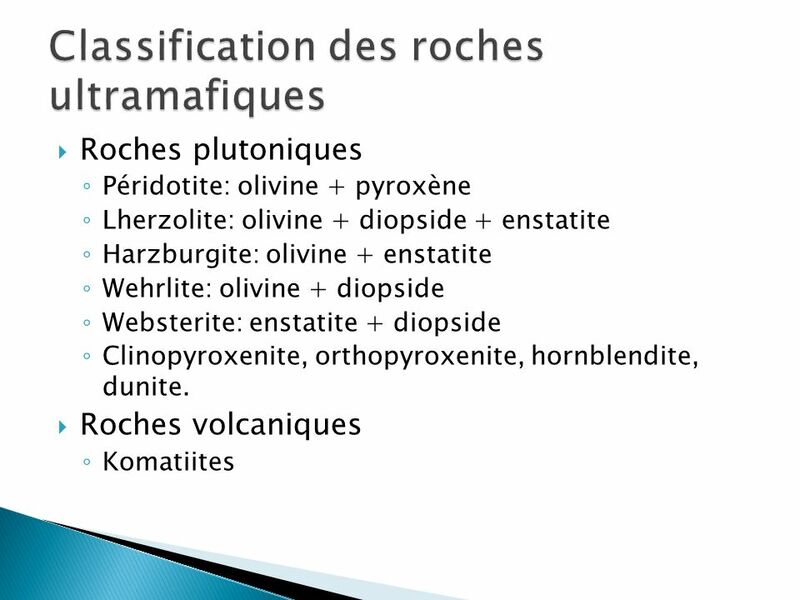 A classification and nomenclature of volcanic rocks. 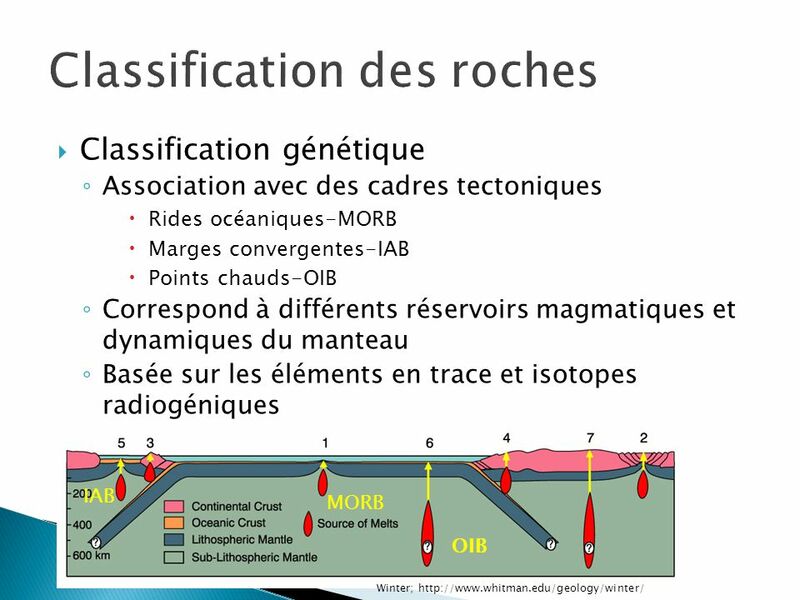 After IUGS. 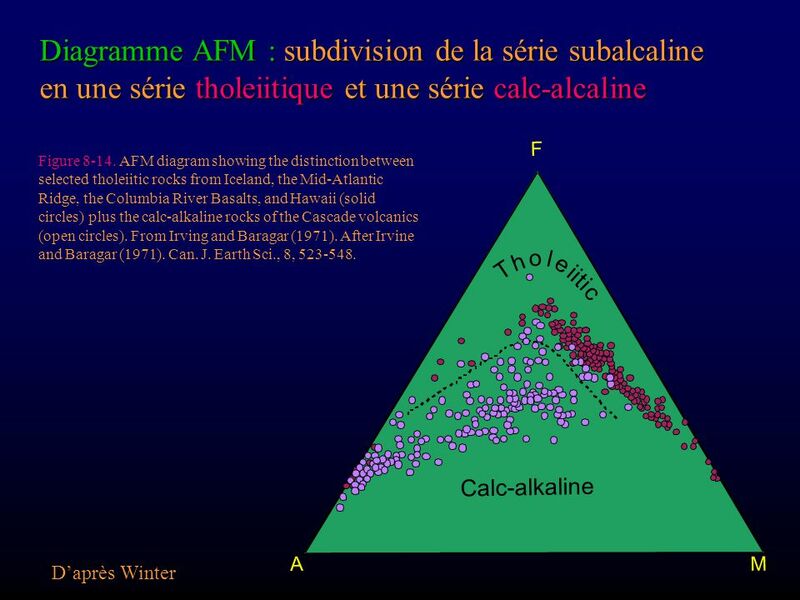 33 D’après Winter Figure Alumina saturation classes based on the molar proportions of Al2O3/(CaO+Na2O+K2O) (“A/CNK”) after Shand (1927). 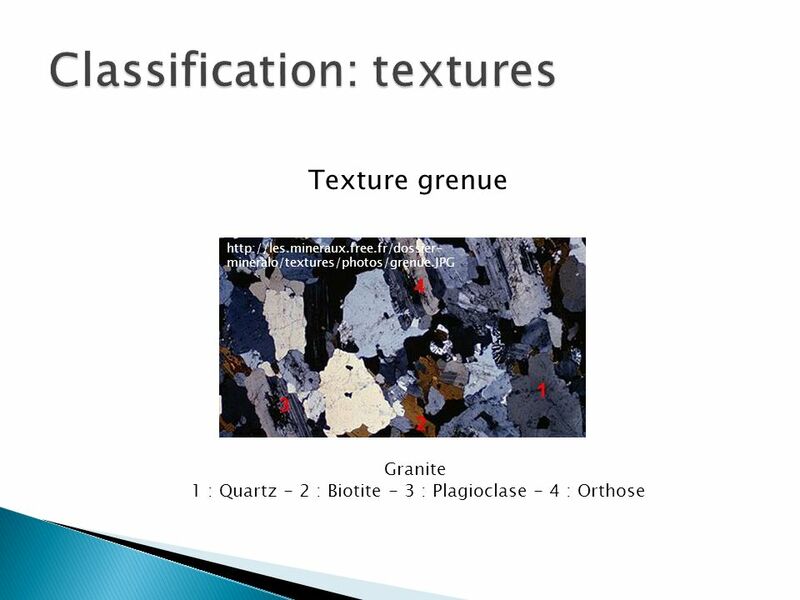 Common non-quartzo-feldspathic minerals for each type are included. 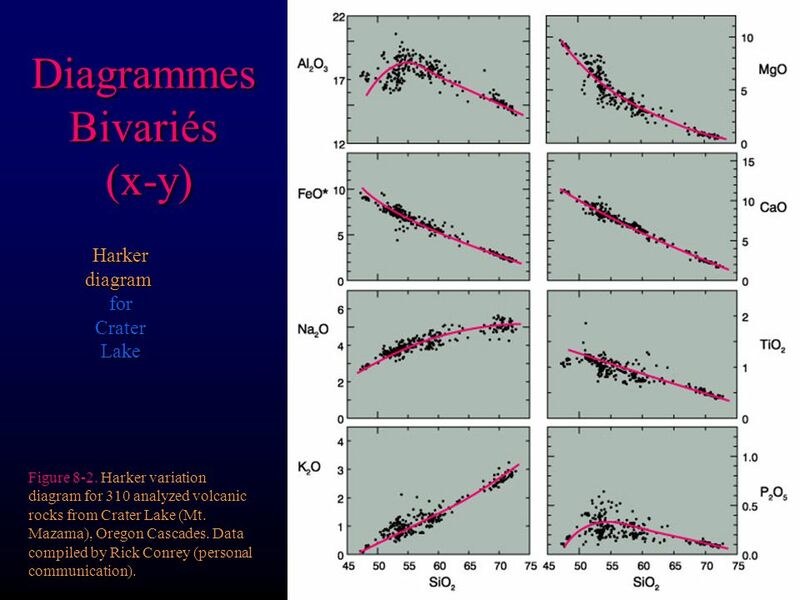 After Clarke (1992). 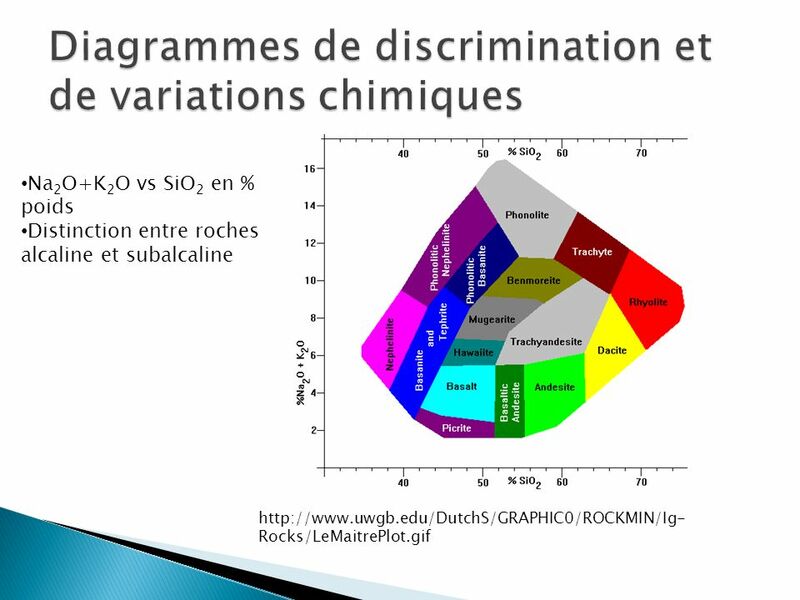 Granitoid Rocks. 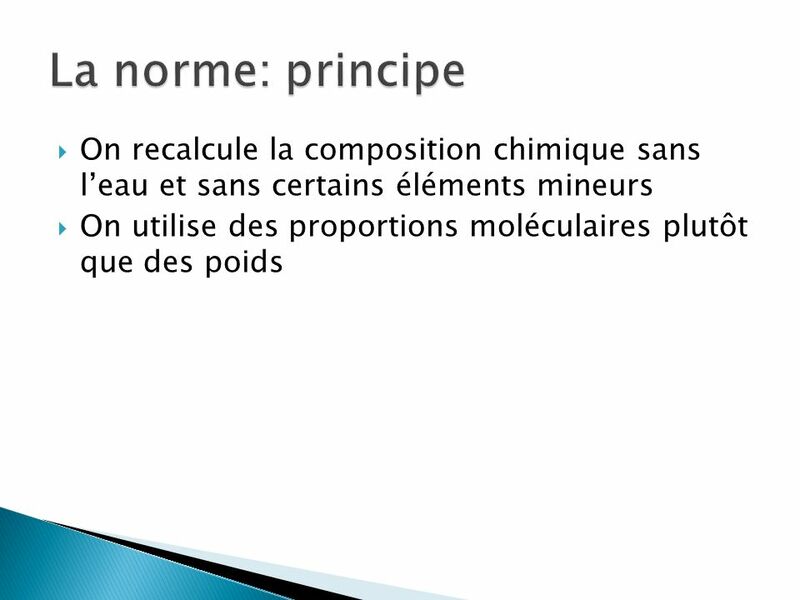 Chapman Hall. 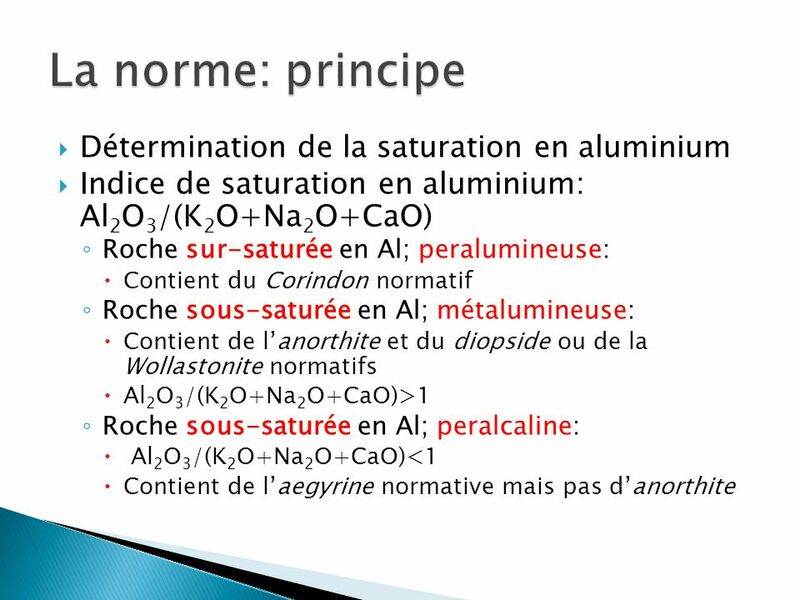 Figure 8-2. 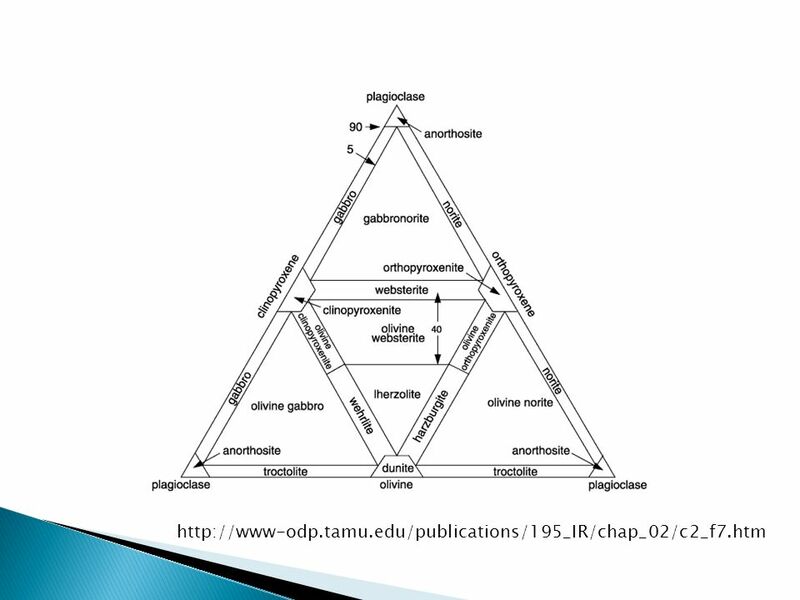 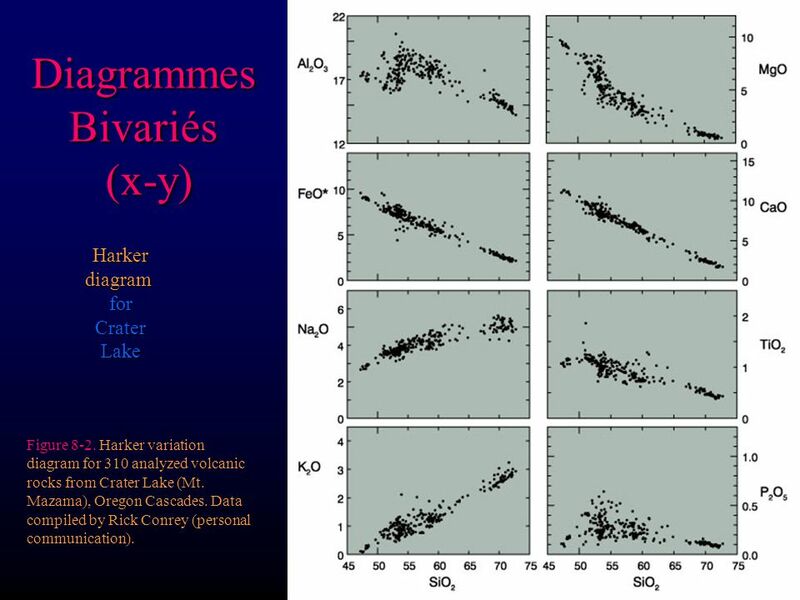 Harker variation diagram for 310 analyzed volcanic rocks from Crater Lake (Mt. 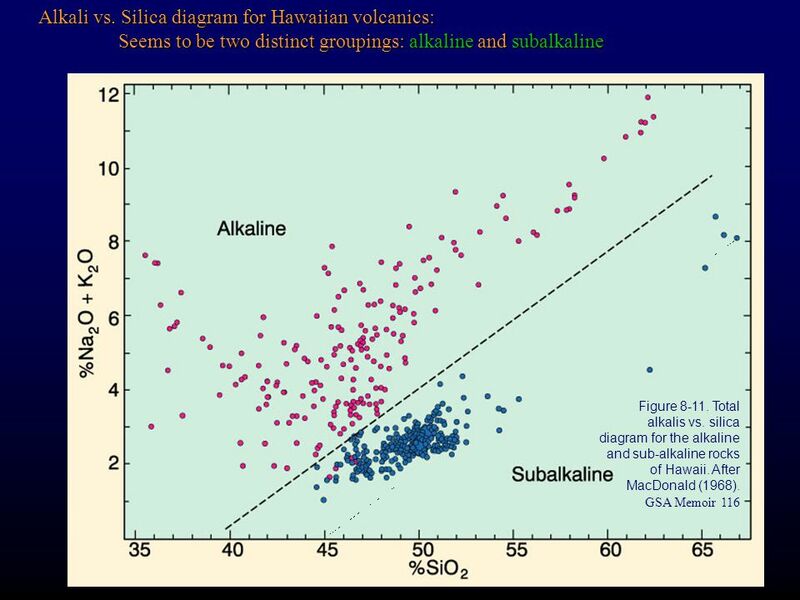 Mazama), Oregon Cascades. 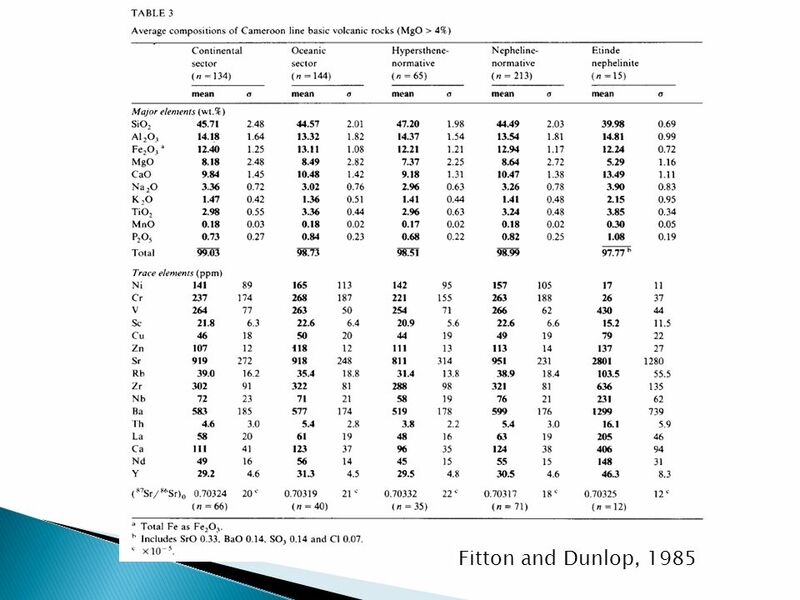 Data compiled by Rick Conrey (personal communication). 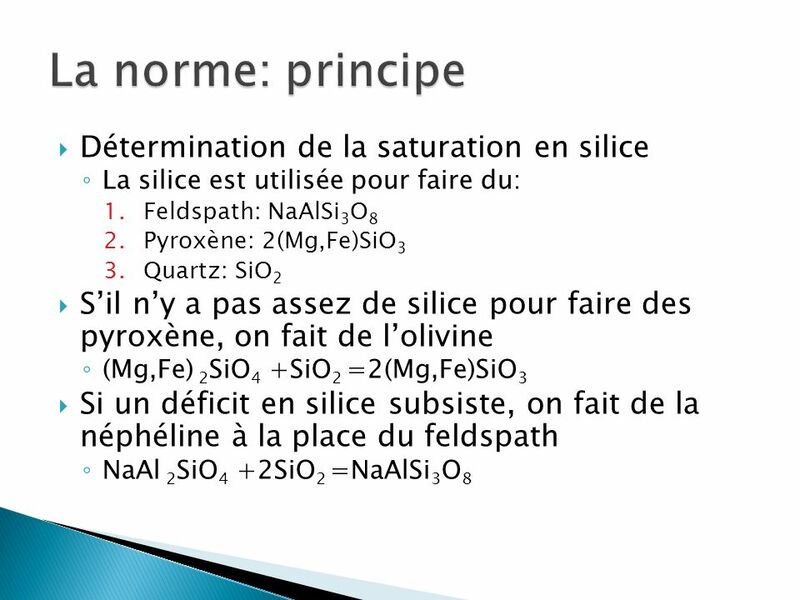 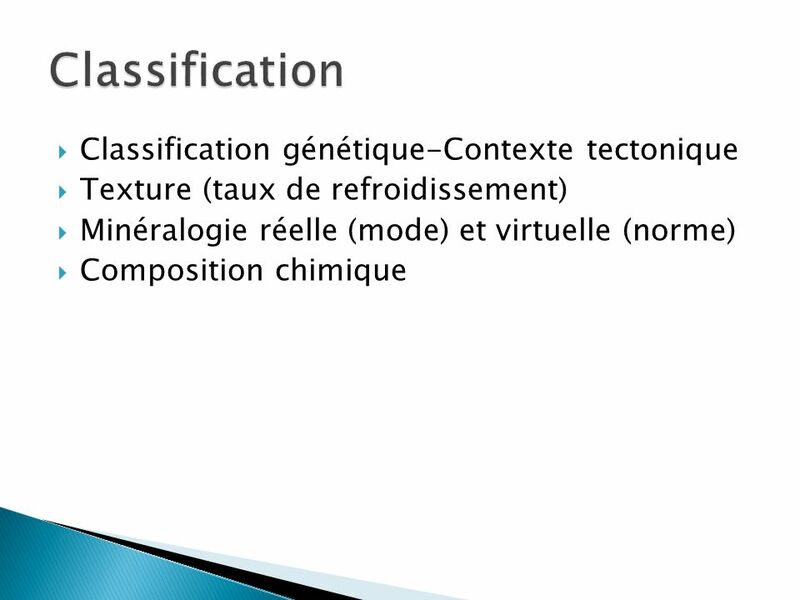 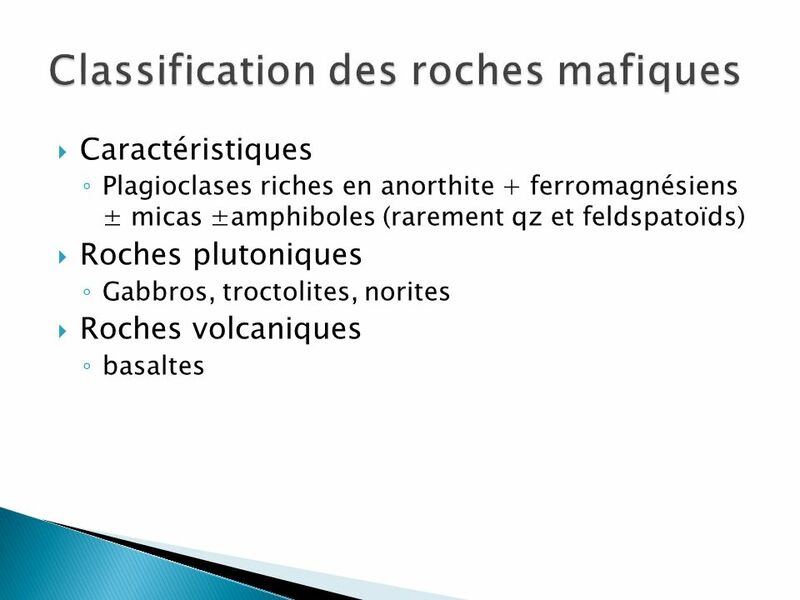 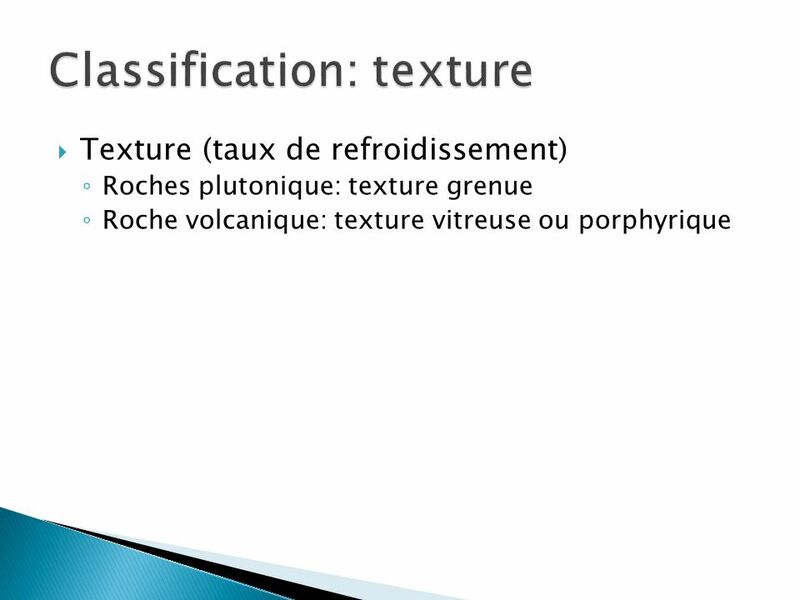 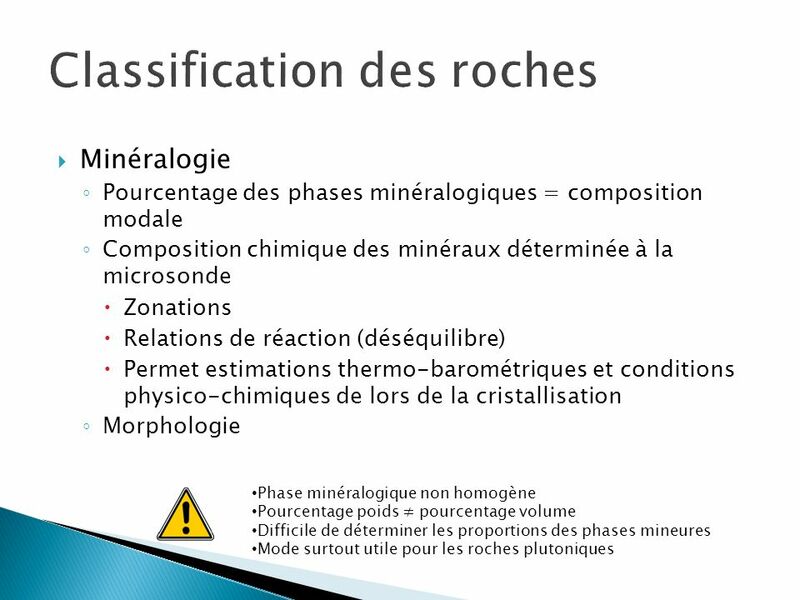 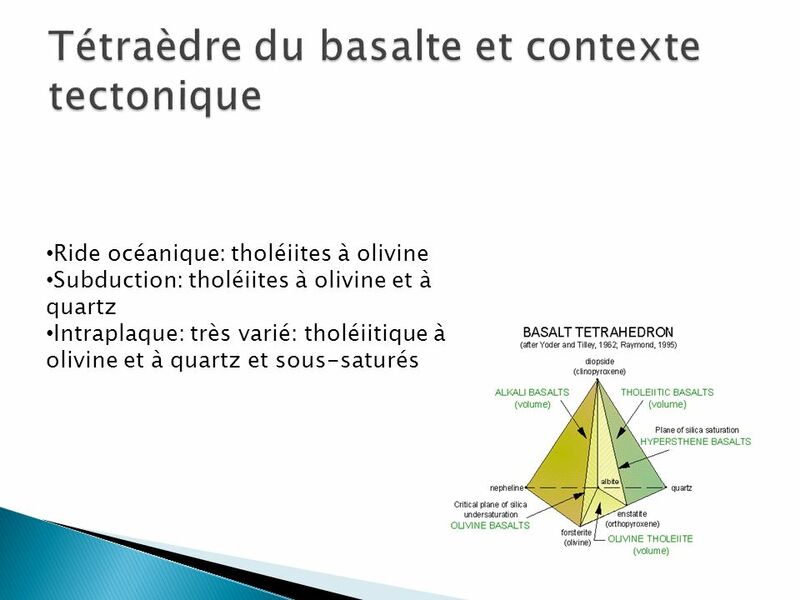 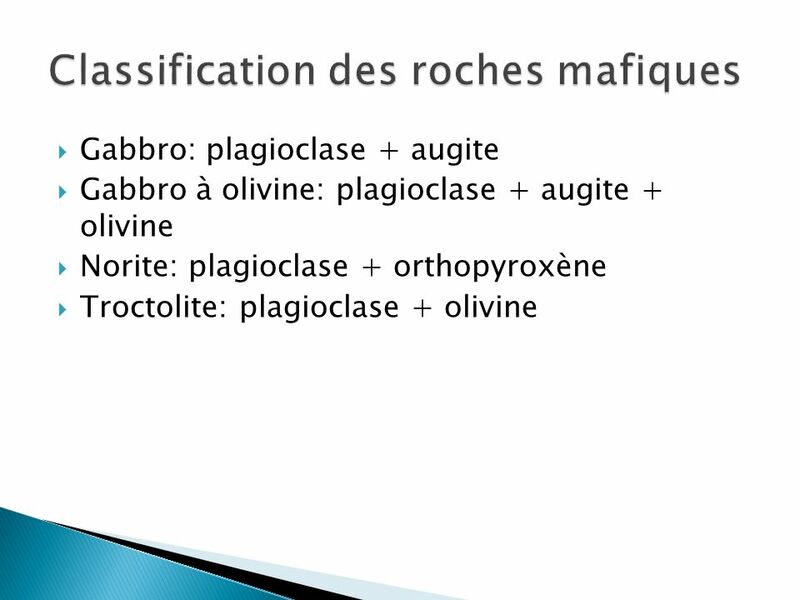 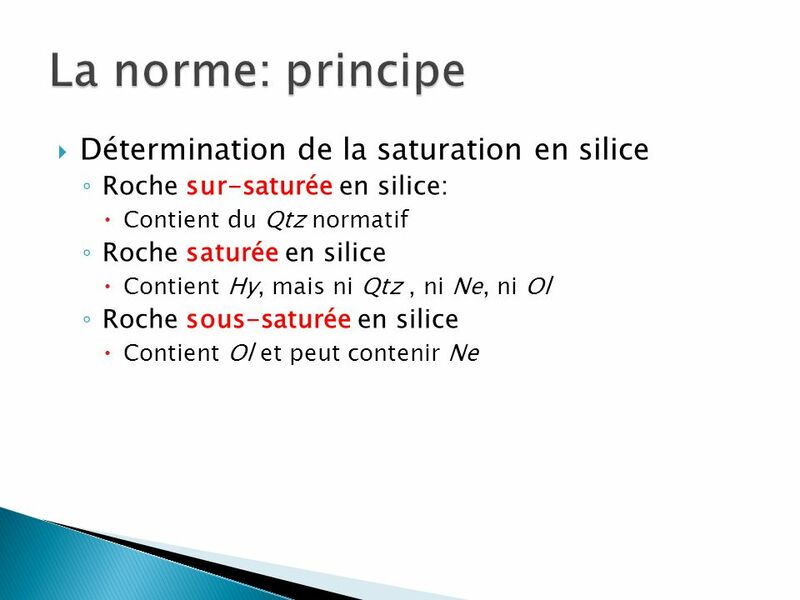 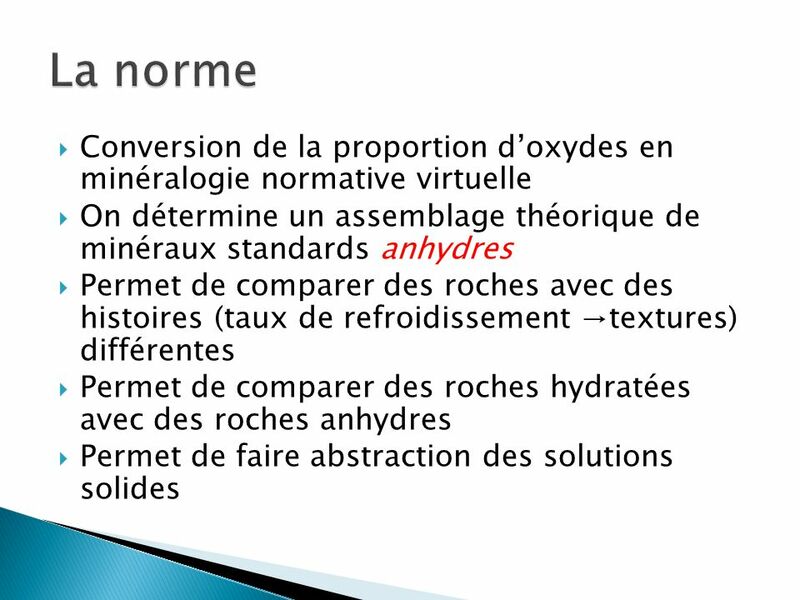 Télécharger ppt "Chapitre 2: Classification des roches magmatiques"
MANTEAU : PERIDOTITE Roche grenue Minéraux : olivine, pyroxène LPA.